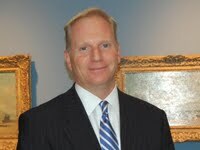 Christopher J. Brownawell has been named the new director of the Farnsworth Art Museum, the Rockland, Maine, museum has announced. Brownawell, who has been director of the Academy Art Museum in Easton, Maryland, since 1993, is expected to begin work at the Farnsworth on Feb. 1. 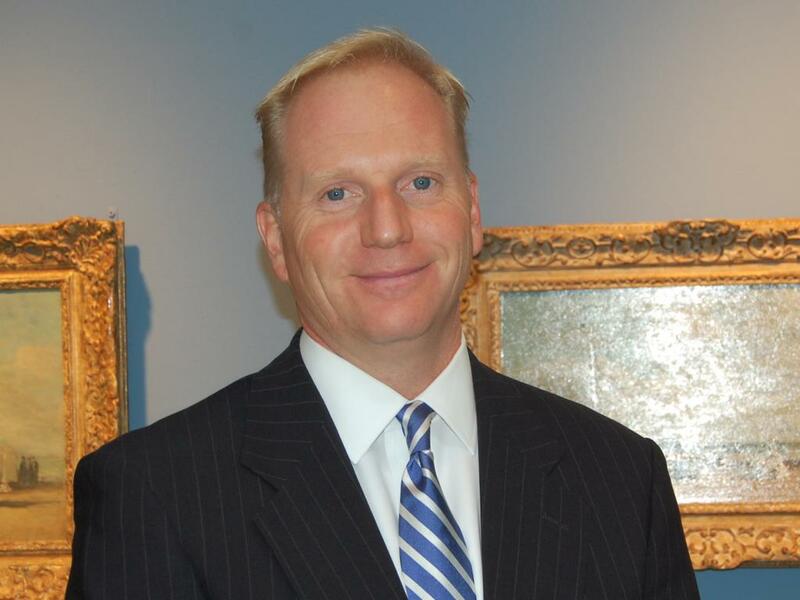 He takes over from Michael K. Komanecky, the museum's chief curator, who has served as the museum’s interim director since director Lora Urbanelli left in January 2009 to become director of the Montclair Art Museum. Komanecky, who continued to organize exhibitions like Jamie Wyeth’s “Seven Deadly Sins” and “Robert Indiana and The Star of Hope” while serving as interim director, will return to his chief curator post. Brownawell worked at the Smithsonian American Art Museum, the Pennsylvania Historical and Museum Commission, and the Commonwealth Conservation Center during undergraduate and graduate internships, before becoming a curator at the Academy Art Museum in 1988. Jim Fitts, the executive director of the Photographic Resource Center at Boston University, has resigned after three years leading the institution, according to an announcement from the PRC. This announcement comes on the heels of the departure of curator Leslie K. Brown, who left his summer to pursue a doctoral degree in art history at Boston University. "Jim was a longtime board member and has served as Executive Director for three years. We are grateful to Jim for his dedication to the PRC, his great enthusiasm for photography, and his creative touch with so many of our projects. Under his leadership the PRC sponsored a master lecture series with world class photographers; produced a portfolio edition of 17 distinguished artists which has been acquired by collectors and museums; founded the Behind the Scenes series of special events for members; and continued and refined our Annual Benefit Auctions and Portfolio Review Weekends. We wish Jim much luck as he pursues other directions in his career." In the meantime, the Photographic Resource Center is seeing an interim executive director. Brandeis University is looking for a “curator and arts coordinator” – not to restore the decimated staff at its Rose Art Museum, but for the Waltham school’s Women’s Studies Research Center founded and run by Brandeis President Jehuda Reinharz’s wife Shula (pictured below). The listing for the part-time job seems to have been posted on Oct. 29, the day following the opening of the exhibit “The Rose at Brandeis: Works from the Collection,” the only exhibit scheduled for the Rose this entire school year. 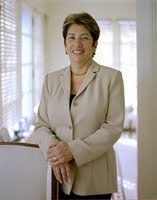 Shula Reinharz, a Brandeis sociology professor and also director of the school’s Hadassah-Brandeis Institute, is the high school sweetheart of Brandeis President Jehuda Reinharz. “In 2001, she opened the Women’s Studies Research Center in a 10,000 square foot facility that she designed and for which she raised all the funds,” according to a university biography of Mrs. Reinharz. Meanwhile there is talk from university leaders of rebuilding the staff at the Rose, which used to number six or seven but has been reduced to two (or two and a half if you include an occasional financial person) because curatorial jobs went unfilled last year and then as part of Mr. Reinharz and other Brandeis leaders’ January threat to close the Rose and sell off its collection, the director and an administrator were pushed out, and another person left. But so far there has been no public posting of Rose positions. Feb. 5: Will defunct Rose replace defunct Safra Center plan? May 15: The end of the Rose? July 27: Rose overseers sue to preserve museum, stop sale of art: If museum can’t be saved, they say give art to new Rose Preservation Fund. 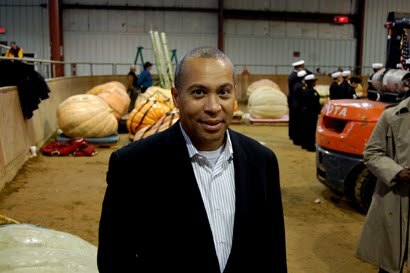 Sept. 25: Brandeis president announces resignation. Sept. 28: Brandeis’s Rose Museum: Where to go from here?. Oct. 2: Administrative exodus from Brandeis. Oct. 14: Brandeis agrees to not sell some Rose art: Attorneys disagree on what happened at hearing yesterday. Oct. 16: Attorney General investigates Brandeis over Rose. Oct. 28: Quiet protest at “Rose at Brandeis" opening: Cops attend too, while Brandeis board meets. Nov. 1: Brandeis considers suing Harper’s Magazine (includes complete summary of our previous Rose crisis coverage). For Andrew Mowbray's new show at the DeCordova Sculpture Park Museum, "Tempest Prognosticator," the Dorchester conceptual artist sculpts giant, ornate, neo-Victorian weathervanes and an anemometer (that spinning-cup device that measures wind speed) out of white polyethylene (a plastic often used in cutting boards). The pieces look like Jules Verne designs manufactured by Matthew Barney. Mowbray's subject is the futility of trying to predict the weather. 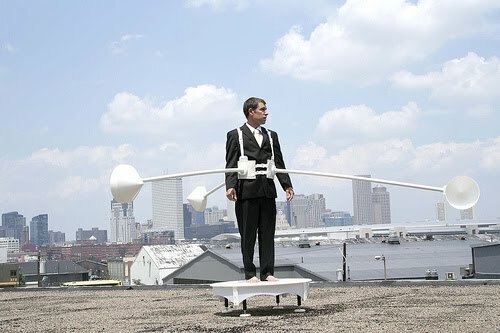 A video shows him on a rooftop strapped into the anemometer, or clinging to the large plastic weathervane (displayed in the next room), and standing on a lazy susan spinning in the breeze. June 2007: Review of Andrew Mowbray at Space Other. May 2009:Review of Andrew Mowbray at LaMontagne Gallery. Andrew Mowbray “Tempest Prognosticator,” DeCordova Sculpture Park + Museum, 51 Sandy Pond Road, Lincoln, Sept. 26, 2009, to Jan. 3, 2010. 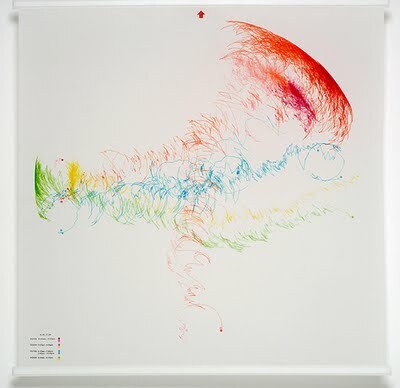 Pictured from top to bottom: Andrew Mowbray, video still from "The Tempest Prognosticator," 2008; "Parachute," 2005; and "Wind Driven Drawing," 2008. Fine arts not in Patrick’s Creative Economy? 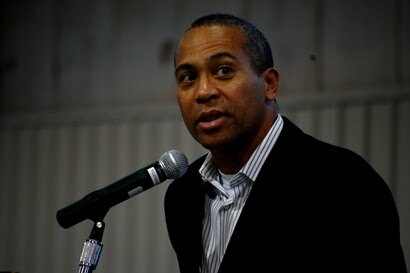 But the question has always been: Who are Governor Patrick and other Massachusetts political leaders talking about when they say they support the creative economy? One way to check is by looking at the “Economic Summit” that Patrick held at the Federal Reserve Bank in Boston on Oct. 27 to “map a path to recovery” from the Great Recession. How many members of the Massachusetts creative economy were among the “nearly 150 corporate, education, and non-profit leaders along with state officials” who were invited? Four, according to a state spokesperson. They represented the graphic design, film and game design industries. Not one of them was from the fine arts. Invited were Beate Becker of Design Industry Group of Massachusetts; Joe Maiella of Crew Star and president of Mass Production Coalition; Darius Kazemi of Orbus Game Works and Boston Post Mortem; and Kevin Sprague of Studio Two. “We also invited representatives from the tourism industry, and economic development leaders and chambers of commerce from several regions that have creative economy rich regions,” writes Kofi Jones, a spokesperson for the state Executive Office of Housing and Economic Development, which spearheads the state’s creative economy initiatives. This is a disappointment to those of us who like to think that the creative economy includes, say, artists. And the lack of representation of the fine arts in state creative economy efforts is not an isolated incident. In October 2008, Governor Patrick signed into law a landmark bill establishing the first state-level Creative Economy Council in the US. The 25-member board to support businesses "providing creative services" that the bill created mandated representation by lodging and restaurant associations but did not guarantee a seat for the architects, artists, filmmakers, computer-game creators, designers, and advertising folks it defines as the creative part of the creative economy. Cheryl Warrick, a painter from Jamaica Plain, did end up being appointed to the council, and other creative types – from the game, film, design industries, etc. – have served on subcommittees. But it remains telling that the landmark Creative Economy Council was more concerned about representing hotels and restaurants than artists. The Harper’s article by Christopher R. Beha (available only by subscription) says Brandeis’s financial problems – which Brandeis leaders said in January required it to close its Rose Art Museum and sell its collection – stem from (1) risky investments in hedge funds and private equity and (2) racking up debt to fund building expansion and renovation projects. “If Brandeis keeps using money it doesn’t have to buy things it doesn’t need, it may soon be the university itself that needs rescue,” Beha concludes. Financial numbers for Brandeis are difficult to come by. The budget stats the school does release – at least to me – tend to be bits and pieces provided without overall budget numbers that would allow observers to put these details in context. For example in May, when I sought interviews with Reinharz, Brandeis executive vice-president and chief operating officer Peter French, provost Marty Wyngaarden Krauss, and board of trustees chairman Malcolm Sherman to confirm their positions and double-check financial information for an essay I was writing for The Boston Phoenix, Nealon told me: “There is the issue of whether there is anything new to add with interviews. So much has been said and written already. I'm talking about my possibly getting the reply: ‘more interviews, Dennis? why?’” In the end, they all declined to speak with me or clarify Brandeis’s financial numbers. In October, I again requested financial information, including Brandeis budget totals for this school year and the two previous years. Nealon provided a little information about this year’s Rose budget but none of the Brandeis overall budget numbers. Economic changes of the past 18 months have been incredibly difficult to forecast, but French’s report will not reassure those who suspect that Brandeis leaders exaggerated the school's financial difficulties in January as an excuse to raid the Rose’s art collection. In their November 2009 issue, Harper’s Magazine published a story entitled “Voodoo Academics: Brandeis University’s hard lesson in the real economy.” In addition to being factually inaccurate, the article is insulting to all members of the Brandeis community as its assumptions about Brandeis and the higher education sector involve gross mischaracterizations. There is a story behind their story and I want to share that with you firsthand. This is in no way a “sour grapes” reaction to an unfavorable story about Brandeis. Once we determined that there a lack of journalistic ethics in the manner in which the magazine conducted its research and reporting, we aggressively fought against the publication of this article. We first became aware that Harper’s intended to write an article on August 31st when their reporter, Chris Beha, called Dan Feldman, Brandeis's Vice President for Capital Projects. During that phone call, and in a subsequent email sent by Beha to Feldman on August 31st, Beha indicated that he was "working on an article about campus expansions over the past generation" and said that he was "interested in considering some of the capital improvements that Brandeis has made." Beha openly admitted that his interest in the topic of Brandeis was the result of a conversation with his aunt, Ann Beha, founder of Ann Beha & Associates, an architectural firm that unsuccessfully pursued business with Brandeis in the summer of 2004 related to the new Fine Arts Center. According to Dan Feldman’s recollection, Ann Beha made derogatory comments to him that implied that Brandeis had demonstrated a lack of judgment and made a poor decision in not hiring her. On September 3rd, 2009 Peter French’s office received a call from Genevieve Smith, an editor at Harper's, who was "fact-checking an article by Beha on Brandeis University's financial woes." She wanted to confirm some of the figures that have already been reported in the press, including articles that dated back to January 2009 in the Daily Beast, information that was inaccurate when published this past January. What is important here is that the basic rules of journalism insist that media outlets must make attempts to interview sources for a particular story before any story is moved to the “fact checking” phase. This was not done by the reporter for Harper’s. Upon hearing that Harper’s was in the fact-checking stage of an article without having ever spoken to anyone at Brandeis in any detail and was relying on inaccurate information from outdated articles, Peter French arranged to speak with the reporter and the fact-checker on September 8th and 9th. During those conversations, Peter corrected the inaccuracies that Harper’s was culling from outdated press articles and provided additional information and background. None of the information French provided in these conversations was used in the article. Our outside legal counsel sent a letter to the editor of Harper’s on September 14th demanding that editors hold the article until a thorough review of Beha’s reporting process and his apparent conflict of interest were conducted. In addition, our attorney asked that Harper’s confirm the story’s accuracy and ensure that other people at Harper’s reviewed Beha’s story. In a final attempt to ensure that Harper’s would be using factual information for their story, Peter French sent an email to the editor on October 2nd recapping the points he had discussed with Beha and Smith. Peter received no response to this email. Perhaps most infuriating among these is this: “What that $28,000 surcharge buys—the financial and social return on a degree from an elite private university—cannot be found in a classroom.” This is an insult to everyone at this institution. Our students year after year talk about the outstanding quality of their educational experiences at Brandeis and the exceptional and world class faculty here. My view is that these more than justify the expense of a Brandeis education. The article also states that “Over the past decade, Brandeis, like many of its peer institutions, adopted the American corporate principles of fiscal shortsightedness and growth-for-growth’s sake that provoked the current economic fiasco.” In reality, Mr. Beha sought no information—and from the article, appears to have no information—about the circumstances that led to the University’s financial plan and about the very serious needs that were the basis for the various capital projects carried out since 1999. Brandeis has been judicious in our decisions about capital projects and the reporter appears to know nothing about our integrated strategic plan or our campus master plan, which have been the basis for decisions about the financing and execution of our capital projects. In any case, our greatest investment, year after year, is in our students, 71% of whom receive financial aid, with a per-student average of over $25,000 in grants and scholarships. The faculty and this level of support for our students are the main reasons student quality has been rising year after year at Brandeis. Mr. Beha writes, “For Brandeis, that loss [in the endowment] amounted to roughly $200 million.” Mr. Beha cites the FY09 starting value of our endowment ($712M), but makes no mention of the fact that at the end of FY09, the Brandeis endowment had unrealized losses of $125.4 million (not $200M), and that in the first three months of the new fiscal year, we have an unrealized gain of approximately $44 million. This amounts to a Fiscal Year 2009 return of -16.96%, which compares with a median loss of -19.14% for foundations and endowments as a whole, according to the Wilshire Trust Universe. The article states that “Following the lead of universities with multi-billion-dollar endowments, such as Harvard and Yale, Brandeis shifted funds from low-risk, low-yield investments into “alternative investments” like hedge funds and private equity.” In fact, Brandeis has been implementing a diversified investment strategy, including alternatives, for over a decade. In that time, the model has proved beneficial through various economic climates. In particular, for FY09, the Endowment’s hedge fund investments reported an aggregate loss of 5%, compared to the S&P 500 loss of 17.4% for the same time period. Brandeis’ alternative investments actually had the effect of softening the blow from the economic downturn. The article also states, “Meanwhile, like so many American institutions (and households), Brandeis had been living beyond its means, paying on credit for a seemingly endless string of expansion and renovation projects.” The reality is that, since 1999, just under half of the cost of major capital projects at Brandeis has been gift funded. Only 43% of that cost has been debt-funded, with the balance from University funds that had been set aside for capital projects. We recognize that the legal process for slander/defamation is an arduous task and one that is difficult to prove; however, we feel that some affirmative course of action must be taken to protect the reputation of Brandeis given that this article is likely to have circulation on the Internet far beyond the circulation numbers of Harper’s. We are analyzing our options carefully. I welcome your ideas and suggestions. We have all worked too hard to bring Brandeis to a level of excellence far beyond our size. We are a great University and I will not allow anyone to denigrate our administration, faculty, students, and alumni. Jan. 29: Question: Brandeis financial management? Feb. 5: Brandeis won’t close Rose? Feb. 11: How do you solve Brandeis’s budget crisis? March 16: What is the Rose family saying? May 20: Voices from the Rose. May 20: Rose collection treasures. 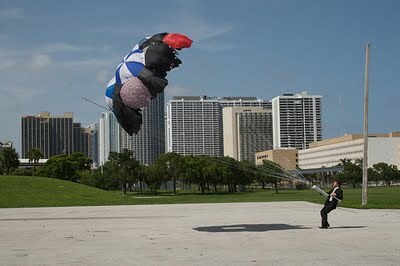 July 31: Key weaknesses in the Rose suit. Sept. 15: Brandeis seeks dismissal of Rose lawsuit. Oct. 8: Rose budget increased?.